Dr. Murad Grigoryan grew up brimming with curiosity. He always liked the natural sciences, as well as other activities as varied as beekeeping and paragliding. He always assumed that his future career would be connected to nature. “I did well at school. I wanted to become either a biology and chemistry teacher, or a doctor. If not, I’d be a stockbreeder, like my dad,” recollected the Director of Aygedzor Medical Center who’s been providing medical care to the residents of Aygedzor and Chinari villages for the past 25 years. 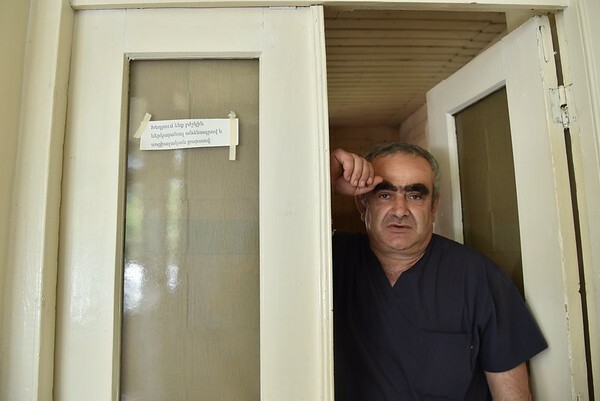 A native of Aygedzor, Dr. Grigoryan, 53, earned his medical degree from Yerevan State Medical University in 1993. Over the years, FAR’s Continuing Medical Education Program (CME) has played a major role in his professional development. Besides improving his overall skills set, CME training has presented him opportunities to interact and communicate with peers, attend workshops and conferences at the Republican Scientific Medical Library, and try out new equipment and treatment techniques before adopting them for his practice. Since he joined Aygedzor Medical Center, Dr. Grigoryan is still the only physician who can do both surgery and emergency treatment. He complains about the clinic’s infrastructure, however. Built in 1912, it has very poor conditions and limited facilities. Recently, FAR renovated and refurbished the “Mother’s Room” where doctors and other relevant specialists teach local parents about healthy nutrition, symptoms of important illnesses to be aware of, proper hygiene, etc., but there is still much more to be done. The clinic also faces another imminent problem. “We don’t have young specialists; no graduate wants to work in this remote area and earn an average salary of about $300 a month. As a result, regional doctors are considered to be low-level specialists,” he said. It will be hard to keep the clinic staffed as its doctors retire. However, the father of two still loves Aygedzor—from its green mountains to its rocky landscapes—and he has never wished to emigrate. His only dream now is to one day paraglide again.